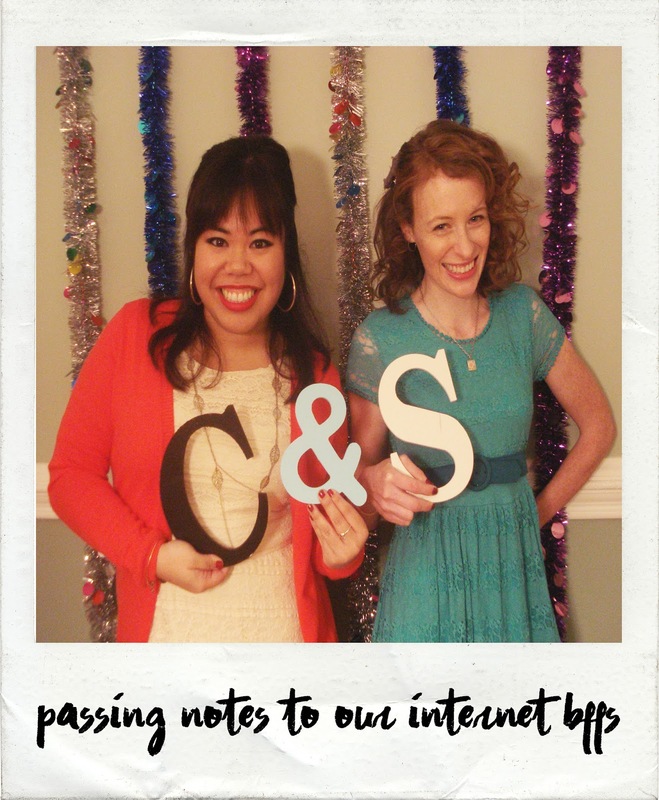 Today we are kicking off a week – A WEEK! – long series of posts exclusively dedicated to one of our personal favorite TV shows of all time – Friends. May 6th (tomorrow!) marks the 10th anniversary of the series finale airing, which drew in 52.5 million viewers, making it the fourth most watched finale in TV history. But more on that tomorrow. This post is all about the people who walked into the world of our six favorite New Yorkers – and then walked out immediately. These guest stars aren’t people like Paul Rudd or Brad Pitt or even Julia Roberts for that matter, but rather the less high profile actors who were only in one episode and the ones you barely remember (or don’t remember at all). Let’s go all the way back to 1994, shall we? 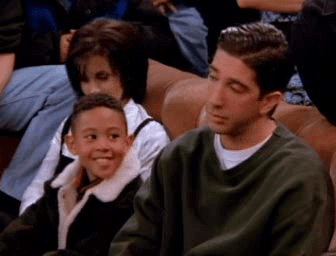 Before she was crazy Jan Levinson who wooed Michael Scott on the office, she wooed Ross … in the most awkward way. Somewhere in between being Stacey Carosi on Saved by the Bell: Malibu Sands and the King of Queens, Leah Remini stopped by NYC to have a baby. While the gang is in the hospital for the birth of Ben, Leah’s character Lydia had no one – so obviously Joey stepped in. This connection didn’t occur to me until writing this post – but the woman who hits on Pheebs at Carol & Susan’s wedding is Big Boo from Orange is the New Black! Roy Gublik was Monica’s prom date in the famous video (you know, the guy who has seen Star Wards 317 times), but you may know him as Donkey Lips from Salute Your Shorts. Remember when Charlie Sheen wasn’t QUITE as crazy as he is now, and considered somewhat of a Hollywood heartthrob? Yeah this was then. He played a guy from the navy who was home for a couple weeks and had a thing with Phoebe. 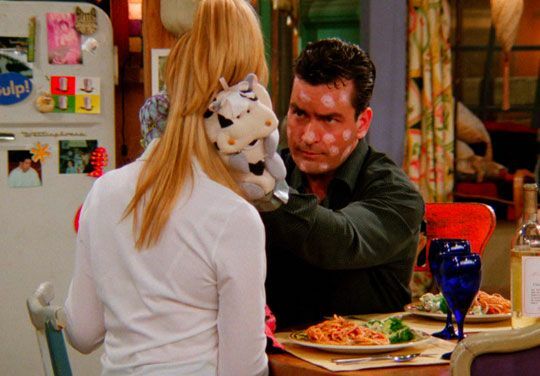 But he gets the chicken pox, which Pheebs had never had before and that explains the odd cow oven gloves. One of TV’s best criers, Mae Whitman, was obviously a child star, but this role gave her the upperhand on Ross, who accidentally broke her leg. Because of this, he has to sell all her Christmas cookies a la the girl scouts. I mean that end scene with the fake space camp?? Come on. Chandler starts dating this chick Ginger and when he finds out she has an artificial leg, he Chandlers it and freaks out. But then she finds out he has a ‘nubbin’ and SHE’S too freaked out so she ditches him. You know when she should’ve ditched everything? When she and her stupid daughter April came into the life of Luke Danes on Gilmore Girls and ruined everythingggg. Did anyone else watch Less Than Perfect? Just Me? It’s the show where I thought Zachary Levi was really cute and then years later realized he was ZACHARY LEVI. Anyways, Sherri Shepherd is like the token black woman here, but oh dear lord is it good. 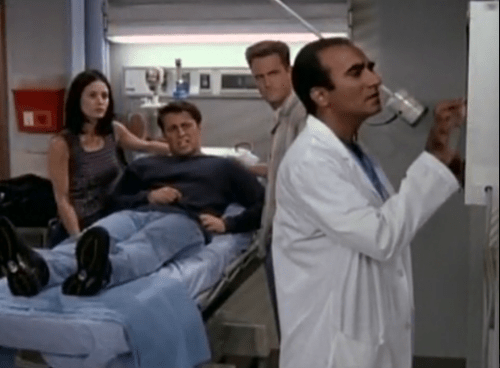 Apparently Joey always needs to have his own separate story line when the episode is set in a hospital. 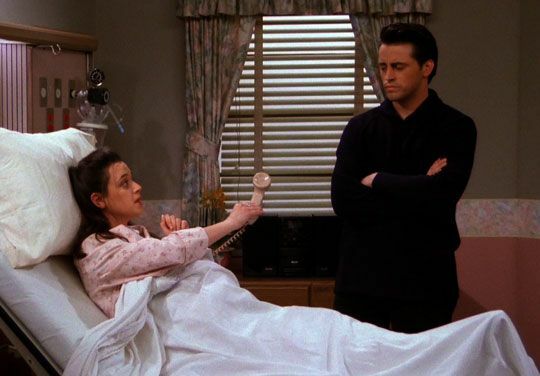 While Pheebs is off having the triplets and dealing with the Fonz stan, Joey has kindey stones. 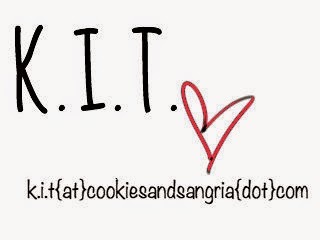 Otherwise known as KIDNEY stones or kidney STONES. Michael Winters couldn’t put Chandler’s severed toe back on his foot mainly because it was a piece of carrot. You know who would have a lot to say about this? Taylor Doose from Gilmore Girls. Speaking of Gilmore Girls, Christopher also made his way from Boston via Stars Hollow to Greenwich Village, playing one half of troubled couple Kyle and Whitney. Pheebs dates Kyle, Ross dates Whitney and Pheebs and Ross end up having a fight on behalf of Kyle and Whitney – who end up working their problems out and start dating again. 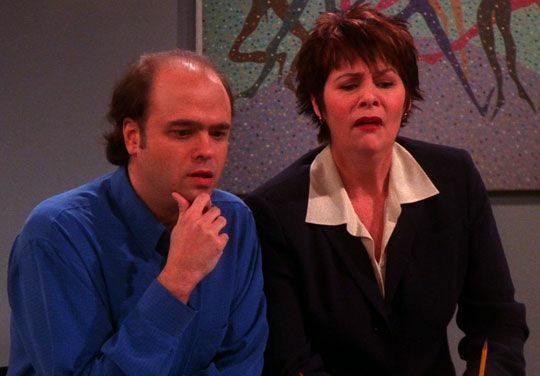 In which Pete Hornberger from 30 Rock has to stare at Joey’s fake… thing. Which falls embarrassingly to the floor. Kevin Rahm may play stupid Ted Chaough on Mad Men now, but I will forever think of him as Tim, Monica’s sous chef (sous = under. 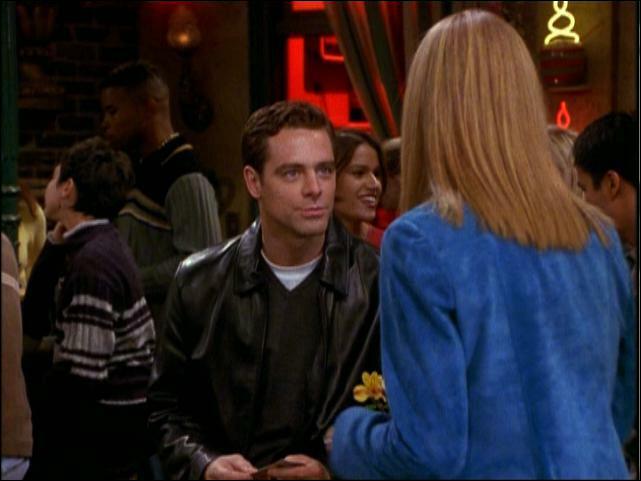 I ‘soux stand’) who Phoebe begs Monica to date but then wants to break up with him because he’s totally annoying. Problem is that Monica wants to fire him too. There’s a part where Tim blows a kiss to Phoebe and she catches it, but when he walks away, she throws the invisible air kiss back at him in anger. I may or may not do this on a regular. Little Emily Osment visits the gang as a trick-or-treater, but when Rachel runs out of candy, she offers a personal check… except pre-Hannah Montana Emily’s name is so hard to spell. Just make it out to ‘cash’. In a parallel universe, Gia, Stephanie’s rebel friend on Full House, grows up to be Joey’s sister who gets knocked up and asks Rachel for life advice. James! Dear, dear James from Scandal. From waiter on Friends to White House Press Secretary, he really moved up in the world. Kinda. Fun fact: Dan Bucatinsky and Lisa Kudrow have been friends for a super long time and are producing partners together, and produce Lisa’s Web Therapy as well as the really cool genealogy show, Who Do You Think You Are? 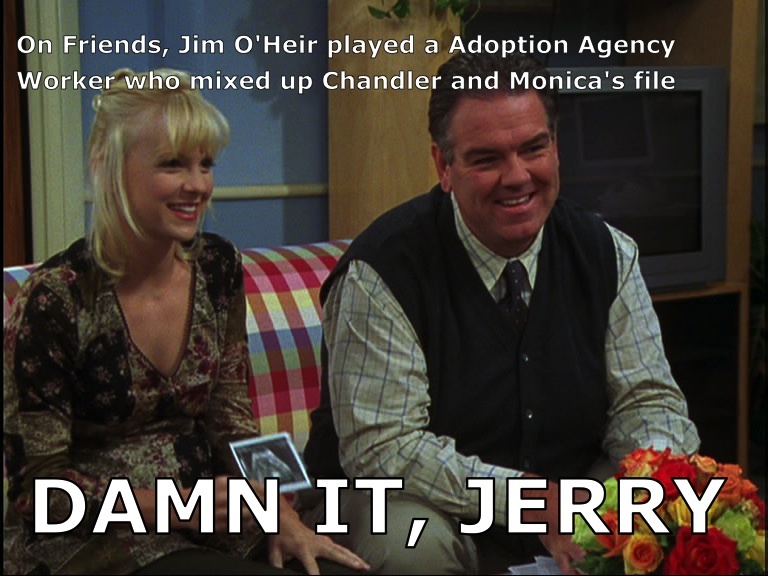 I mean how crazy is it that Jerry/Garry/Larry/Terry helped Andy Dwyer’s IRL wife find her baby out of wedlock find a home with Chandler and Monica?? This role is weird because Ellen Pompeo is playing fairly nice and not as Type A as Meredith Grey. But she looked totally rad in the 80s flashback! Daryl Robinson pre-Dunder Mifflin was helping Phoebe legally change her name… you know, to Princess Consuela Bananahammock. Jane Lynch plays a realtor showing a house to Chan and Mon – but the other person looking at the same house? Hint: OH. MY. GOD. Hey Dean Pelton, relax. There was no left phalange to begin with. What about Hugh “Greg House” Laurie? He deserves to be on this list! !